Linking to a pdf can, in many cases, be a very convenient way to add content to your site. We often find that clients will want to add menus, brochures, instructions etc. that may be most effectively viewed, shared or printed in pdf format. Uploading a pdf and adding a link in your site’s content so that visitors can download this document is all possible through the standard WordPress admin options. When you are editing a page or post in the WordPress admin, there are a group of four options above the main edit window labelled ‘Upload/Insert’. The first is for uploading and managing images, the second for video, the third for audio and the fourth for other media (text files, pdfs etc.). 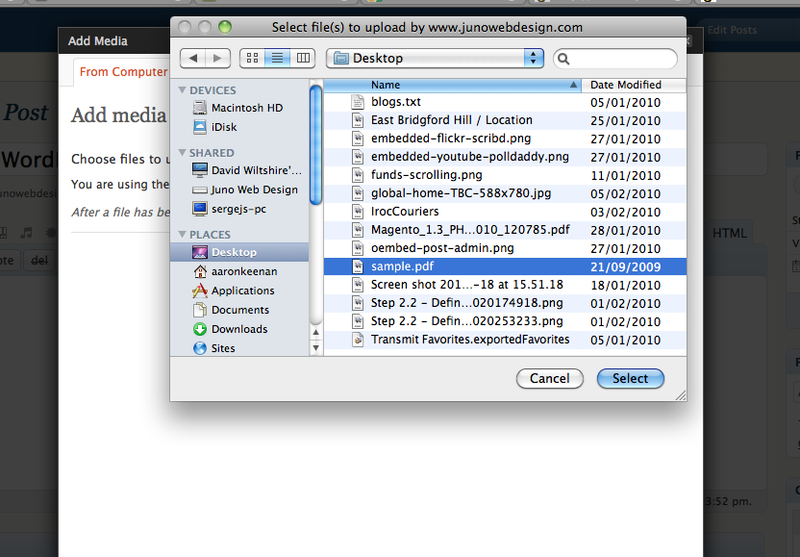 If you select the fourth option (named ‘Add Media’) you will then open a pop up window where you can upload the pdf. Once the file has finished uploading, you will have a choice of options. Selecting ‘Insert into Post’ (as you would with an image) will not work here – it only inserts the document’s title into the body content of the page or post. 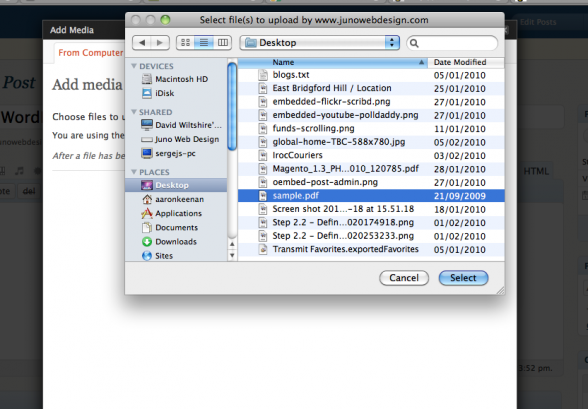 To insert a link to the pdf, rather, you can first select the ‘File URL’ option. 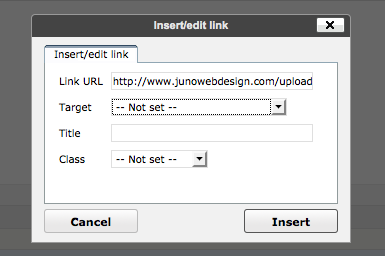 Doing so will cause the file’s link location to be displayed in the ‘Link URL’ field. You can then copy this url to your clipboard and exit the pop up box. Next enter the text that you will use as the selectable link text in the content of the page or post. Click and drag over this text to select it. Once you have selected the text, the link button will become accessible. You can click this to bring up another pop up box where you are able to paste the url for the pdf that you had previously copied. You will finally need to click ‘Insert’ to add the link.